Guard Houses: Upgrade Workplace Safety | BIG Enterprises Inc. Historically considered a luxury, guard houses are a necessity for many businesses, including hospitals, airports, military bases, government buildings, private companies, and so on. 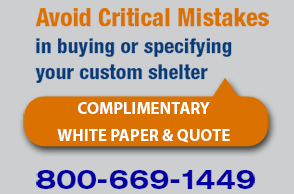 Whether you are interested in choosing your own security guard house design or looking at standard parking booths for sale, it is important that you have the structure manufactured by a reputable company. That way, you have peace of mind knowing that every aspect of the design and build will match your exact specifications. One mistake that many businesses make is waiting to purchase secure guard shack enclosures until a threat or criminal activity has occurred. Although taking that action is better than just hoping that something else does not happen, consider a guard shack as a preventive safety measure. Employees feel more secure, and an entire business is better secured. If you need a way to monitor and control vehicle traffic, finding quality parking booths is an excellent solution. Strategically placed, manned parking booths during business hours will improve the flow of traffic and deter crime, such as auto break-ins. Another incentive is that manned parking booths serve as a point of customer service, which is a huge benefit for a business. For businesses that need significant protection, such as laboratories, chemical plants, and government buildings, a reputable manufacturing company can customize the perfect security guard house design. Due to the nature of business, monitoring and security capabilities are a must. As part of the design, various features and amenities can be added that provide the guard with a more secure work environment and the ability to be more effective. As an example, security guard shack enclosures can be blast resistant and bulletproof. In the event of an imminent threat, not only is the guard protected but he or she has the opportunity to take quick action to alert security on the inside of the building, as well as law enforcement. Other features that enhance the security of a guardhouse include special outside lighting, technology and communication setup, and a unique locking mechanism on the door. To take safety and security to the next level for business, consider a prefabricated guardhouse. B.I.G. Enterprises is the industry leader, offering years of experience and expertise. Learn more about the company and look at products by visiting the website. To speak with a company representative, contact us by phone.